Bena nd Claudio have been hard at work this week building out a new table to rearrange (and improve) our woodworking area of the shop. Thanks guys! 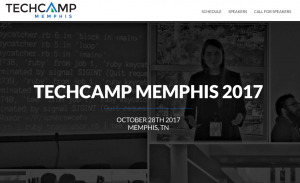 TechCamp Memphis 2017 CFP is open! They have a makers track and they’re looking for people like YOU to come share what you’re working on, why it’s cool, and show off neat ideas! Come chat with us in Telegram! Join us and other Memphis area makers in Telegram! A chat room about all things Midsouthmakers! We love to share our space and host events for our members. Part of being a member is the ability to host a small (10-15 attendees) event at the space. Midsouth Makers has hosted MemphisPHP.org Meetups, Board meetings for Memphis Technology Foundation and HACKmemphis, as well as many smaller events such a LAN parties and other gatherings for organizations. 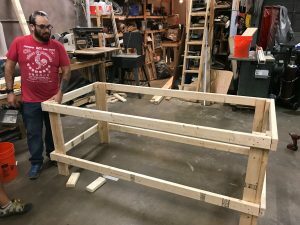 How Do you host an event at Midsouth Makers? Step 1: One of our members must be deeply involved with your organization and take responsibility for being at the space while the event is happening. Step 2: The Midsouth Makers member that is your representative must contact the board board@midsouthmakers.org to schedule the event to ensure it does not interfere with any other events at the space. Step 3: Promote your event! We’ll help Promote your event across all of our public channels. Remember: Midsouth Makers is a functioning shop and work area constantly in use by our members. While members have first priority to using the space we do try to facilitate meetings and gatherings where our members are deeply involved as much as we can. All paid Members are welcome to join for all Board Meetings. Board Meetings are not open to the public. If you would like to visit the space please check out one of our upcoming Open House events.